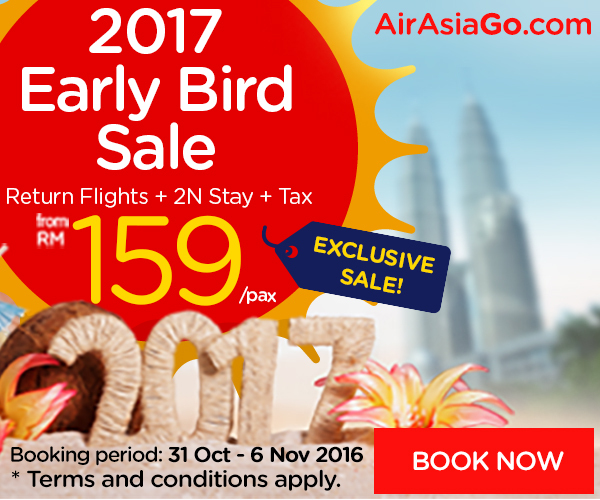 AirAsiaGo.com's Early Bird 2017 Sale is on NOW! That’s right, there are tons of long weekends coming up so time to mark the calendar for 2017! BIG saving up to 45% when you book your travel package (Flight + Hotel) through AirAsiaGo, Malaysia’s leading one-stop travel portal. The early bird catches the worm - get in quick and login to AirAsiaGo to book your vacation from 31 October and 6 September 2016, before they slip away. From as low as RM159 per person for 3 Days 2 Nights, including Flights, Hotel Stays and Tax, it is time for you to start planning your adventures in 2017! This exclusive deal is available for those who are planning their trips anytime between 1 April 2017 and 15 September 2017, to the top destinations of Malaysia, Indonesia, Philippines, Australia, Japan, Korea, Mauritius, Thailand and more. There are 5 long weekends during this period! Yes, we counted! Register as an AirAsiaGo Member at https://www.airasiago.com.my/login-gomemberdeals to enjoy more exclusive hotel deals. Login to www.airasiago.com for further information. For real-time updates, search and follow AirAsiaGo.com on Facebook, Twitter or Instagram. The AirAsiaGo Mobile App is available for free download on both AppStore and Google Play or visit http://www.airasiago.com.my/app for more details.